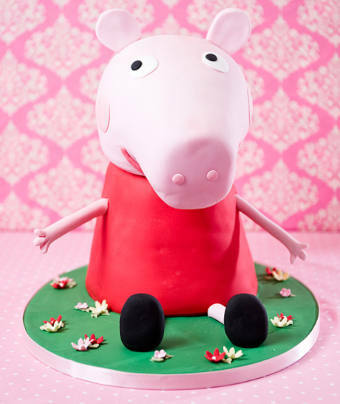 Pig out on cakes with Peppa! There are oodles of great children’s TV shows gracing our screens, but one of the most popular for children has to be that of Peppa Pig. Full of oinks and giggles, the episodes revolve around the adventures of cute pig, Peppa, and her little brother George. They are cute, cheeky and have lots of furry friends to get up to mischief with. They are ideal characters to bring to life in cake form. The animated TV series cleverly morphs the traits of animals with those of humans in a collection of stories revolving around everyday activities toddlers can relate to. Adventures of going to playgroup, going swimming, visiting grandparents, going to the playground, or riding bikes make kids feel the world of Peppa Pig could even be real! Toddlers love Peppa and a Peppa Pig birthday cake is bound to bring gasps of joy from your little ones. All of Peppa’s animal friends speak in English, but sprinkle their conversations with animal noises. The snorts of Peppa and George often have little ones in fits of giggles, and every episode ends happily, generally with hoots of laughter. There’s a Peppa Pig World at Poulton’s family theme park in Hampshire, where on selected dates toddlers can meet Peppa Pig and George! Excited children not only get to meet their TV friends, but can also enjoy gentle rides and let off steam in themed play areas. For Peppa pig fans, this is a real treat indeed. If you have a Peppa fan amongst your family, then a Peppa Pig cake is a must. Peppa and her friends would most definitely approve. Homemade cakes are a feature in the yummy world of Peppa. There’s nothing more satisfying than a Granny Pig’s homemade chocolate cake. Well shh, don’t tell, but we have the same secret recipe in our Cake parlour. Peppa Pig themed birthday parties are a hit in the world of toddlers. Making little piggy noses and ears for all of your little guests is sure to get the party started with a big oink. Delight your little piggy guests with a dessert table full of little piggy treats from colourfully decorated Peppa Pig cookies, to cake pops representing all of Peppa’s delightful friends. And why not crown the special day with a fabulous Peppa Pig birthday cake? Perhaps your little one has a favourite episode or character you would like to portray. 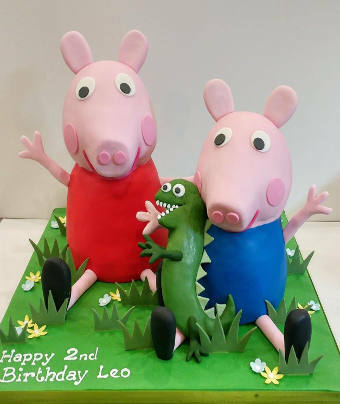 At Cakes by Robin we absolutely love getting creative, and bringing Peppa Pig to life in cake form is one of our favourite cake missions. Our Peppa Pig cakes not only look fabulous, they taste delicious too. We know that pigging out on a scrumptious cake is obligatory at a Peppa Pig birthday bash!